I was recently invited to join a women's social group here in Joburg. This group meets regularly to participate in all kinds of diverse activities. On Wednesday I attended my first event. The outing was a visit to a traveling exhibit about the Titanic. This exhibit features artifacts pulled from the ocean floor as well as details about various passengers and crew. Afterwards the group had lunch together. Although the Titanic exhibit is normally something that I would be interested in I had to drag myself to the event yesterday. I had horrible jet lag that resulted in not being able to sleep more than two or three hours the entire night before. Instead, I was awake shoveling food in my mouth because my body clock was so messed up and I was convinced that I was hungry. I spent most of the morning feeling sorry for myself and thinking about how I could get out of going. I finally decided that I needed to go because it would not make a positive first impression to not show up. Also, the woman who invited me to join the group organized the visit to the exhibit and I told her I would be there. I told her this on Tuesday (I landed back in Joburg on Monday) when I was feeling absolutely fine and was busy patting myself on the back thinking I had escaped jet lag. Even as I drove to go and meet everyone I was still concocting excuses (lies) in my head about why I couldn't make it. Luckily I remained honest, persevered and did attend. 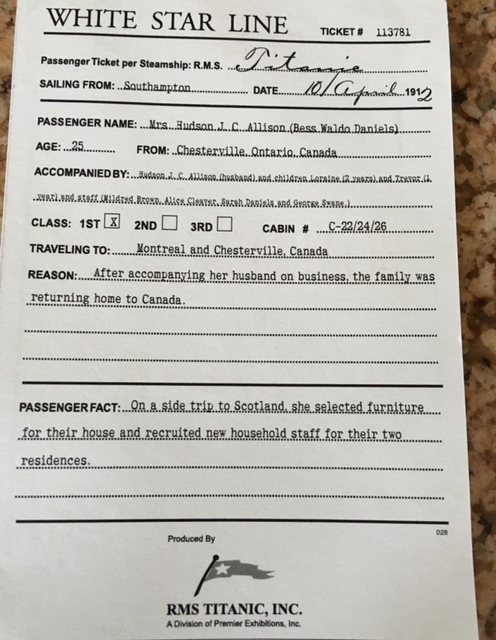 Upon arrival each person was given a boarding pass that contained a name and details about a real passenger who was on board the Titanic. We could then see by looking at a diagram of the ship where that passenger's cabin was located. At the end of the exhibit we saw a list showing the names of who survived and who did not. As you probably know from the movie starring Leo DiCaprio, everything on the Titanic was based on class. There were different dining rooms, menus and china used based on the class of ticket purchased. Most of those people in third class were immigrants heading to America. I learned that while not lavish, traveling third class really wasn't that bad. Each third class passenger had his/her own bed and had access to more food daily than he or she likely was used to. I was surprised that the woman listed on my boarding pass, Mrs. Hudson J.C. Allison (maiden name Miss Bess Waldo Daniels) did not survive as the largest number of survivors were those traveling first class. I did some research, and by research I mean that I read through the free issue of People Magazine that they handed out at the exhibit which contained more details about some of the passengers. By the way, this part was not really explained and I did think it was odd that as we were leaving each of us were strongly encouraged to take home a free copy of South Africa's People magazine. I didn't realize the connection until I read through the magazine later that night. Anyway, reading through People I learned the details surrounding Mr. and Mrs. Allison and their two year old daughter, all three of whom did did not survive. 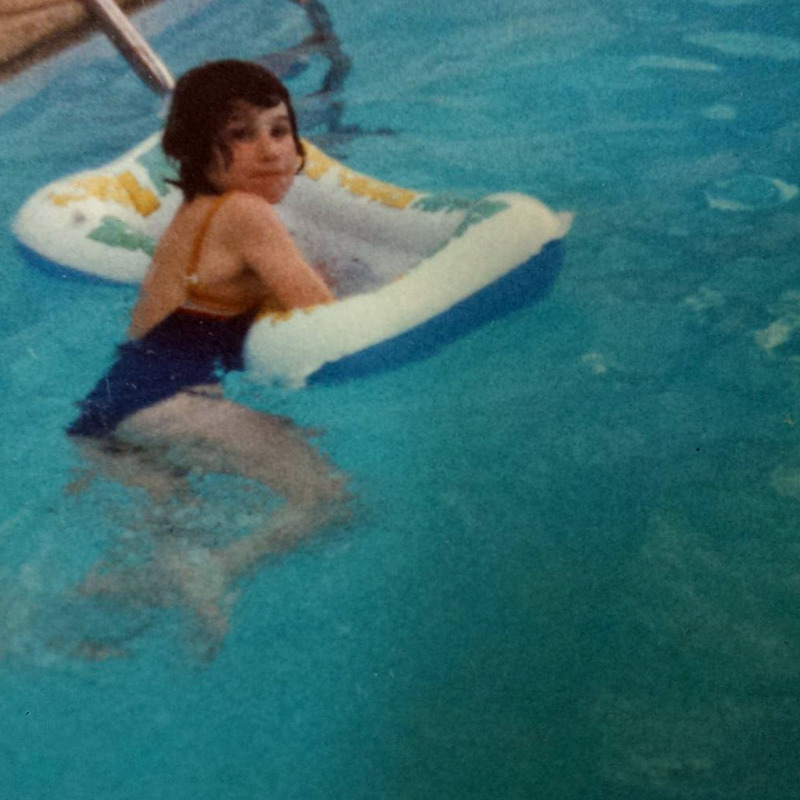 Their daughter, Loraine Helen, was the only child from first class who died and her body was never found. The Allison's three female servants, who were traveling with them, did survive but their butler, Mr. George Swane did not. When the Titanic began to sink, Mr. and Mrs. Allison were frantically searching for their one year old son, Trevor, who was with his nanny. The couple refused to board a life boat without their son. Tragically, the reason they couldn't find their son was because he was already safely on a lifeboat with the nanny. Trevor was the only member of the family to survive. He was adopted by his uncle but later died from food poisoning when he was 18. The article said there were many people on the Titanic who chose to die because members of their family were not going to be able to get on life boats. I wonder if that would still happen today? Can you imagine a more heart wrenching decision? Thoughtful entry! I clicked through to your blog from your tweet. My husband & I are attending the 1st class dinner on Friday 30th and we are looking forward to it. Thank you Jennifer! I did not know about the first class dinner. That sounds interesting. Enjoy! Interesting that they don't do the entrance thing any more at the apartheid museum. I have read about that but have never been and have never experienced it. I wonder why they did away with it. Maybe it was just too painful and uncomfortable for many attendees?